This trio of flat braids is examples of a modified version of the Hira Yatsu X structure that I adapted for the disk from Jacqui Carey's book Japanese Braiding: the Art of Kumihimo. 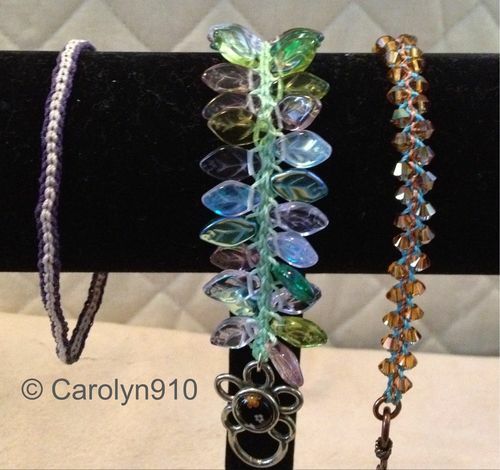 Left is a plain braid, center is Czech pressed glass leaves, and right is 4mm Swarovski crystals and 1mm wire lace. All are made with S-Lon/C-Lon Tex 210/bead cord. Braids made between 2006 and 2009.